You’ve decided to move home; how exciting! Selling quickly and efficiently will save you time and in the long run, help you sell your house for more. 1. Get into the right frame of mind for selling – decide when you’d like to move by, and start making plans. If you have too much furniture for your new home, plan how you will reduce it. If you have lots of clutter, it’s time to tackle it. Sort out your garage and your attic, ready for your move. You’ll feel more mentally prepared for what’s ahead by taking small steps now. 2. Tempt your viewers across the doorstep – stand at the kerb and make sure your buyers will see your house in its best possible light. Is your gate straight and clean? Your paintwork and windows looking good? Your garden neat and tidy? We know that on average, ten potential buyers will drive past your home for every one who books a viewing, so stack the odds in your favour, and give your buyers a reason to view. 3. Get your home ready for photography and viewings – neutral colours and plain bedding photograph much better than colourful patterns, and will make your home seem more contemporary to a buyer. If you’re not sure what needs changing, take some photos of each room with your phone, and study them with a critical eye. What stands out, and what distracts the eye? Keeping spaces clear and uncluttered will help a buyer imagine themselves living there, and avoid being turned down just because your colour scheme isn’t to someone else’s liking. 4. Do your homework – now it’s time to determine the potential selling price of your home, before you ask an estate agent to give you their opinion. That way, you will know if they are just trying to win your business with an over-inflated valuation, or even undervalue your home and perhaps cost you money. Of course, your research may not be infallible, but it will give you a good basis in fact from which to discuss a pricing strategy with your chosen estate agent. c. Your floor area – a spreadsheet of square footage and prices of comparable homes to yours can offer up valuable information about what your home is worth, per square foot (or square metre if you prefer). 5. Choose the right estate agent to help you move – an estate agent who is truly on your side is the final piece in the jigsaw. 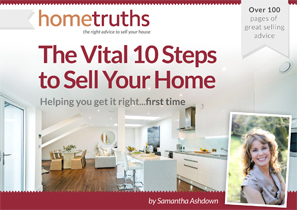 With the right agent by your side through your home-selling journey, it will feel easier, less stressful and smoother. Make sure you choose an agent you like, trust and feel comfortable with. Imagine making a difficult decision over your house sale: would you feel supported by them? Will you trust their guidance? Just picking an agent because you have seen their sale boards up, or because they sold a friend’s house isn’t going to help you if the road to your house move becomes a little rocky, so choose carefully. Getting your frame of mind, your house, your presentation, your price and your estate agent all ready and prepared will help your house sale progress more smoothly and your move more enjoyable. And if you’d like some help in choosing the right estate agent for you, let me know here.